Back to the Garden – Learning to live with the land … not just on it. Learning to live with the land … not just on it. I enjoy drinking coffee. For some, that is already an activity that is non-sustainable by definition (we don’t grow it in Cincinnati) and puts me on the wrong side of environmental correctness. However, I thought it would be interesting to see if I could change the way I enjoy coffee and increase the delight I take in my first cup in the morning with the knowledge I was reducing environmental damage and providing better habitat for birds. If you are even more interested, here is a link to the original article I read: Shade-grown coffee sustains birds and people. I also discovered a wonderful website/blog about coffee and conservation here: Coffee Habitat. As part of this action plan, I changed the kind of coffee I drink and also the way in which I make it. I left the world of convenient single-cup automatic coffee delivered to my mug whenever I like and adopted a more manual, less wasteful approach. To do this required that I dispose of the coffee maker that produced a pile of discarded plastic each day with a kettle to make hot water, an aero press, a manual coffee grinder and a stainless compost bucket with a charcoal filter for my kitchen. In this way I save energy (and get exercise) hand grinding my coffee beans, hand-pressing the coffee and then placing the grounds directly into the compost bucket (see a photo of these items below). Recently, I’ve been using a pour-over method for making the coffee rather than using the aero press. Using a stainless filter with either method allows me to make coffee without creating any paper or plastic waste while providing plenty of coffee grounds for our garden. While it was challenging to change my morning routine of coffee making, the good feeling I get from this new habit every morning (and the lack of guilt from not creating another pile of empty plastic containers) made this a rather easy transition — one that I will likely continue for the rest of my life. This new routine also creates an interesting conversation anytime I have someone for whom I am making coffee in my home. It really is better than non-sustainably grown coffee and that alone makes an impression. The other good benefits that come along with it are a bonus conversation. You have to love creating a new practice that is good and does good at the same time. Death sentence for butterfly sanctuary? Author Mark PlunkettPosted on December 13, 2018 January 28, 2019 Categories UncategorizedLeave a comment on Death sentence for butterfly sanctuary? When I was a young man, I listened as Joni Mitchell cried out that we “don’t know what we’ve got till it’s gone.” Her lament that “they paved paradise and put up a parking lot” resonated with many baby boomers. Perhaps you are more familiar with the Counting Crows cover of Big Yellow Taxi. No matter the version, the words of the song continue to speak to those of us who are concerned that we are losing the birds and the bees. I am no longer that young man and I have come to realize that in modern suburbia, we haven’t paved paradise with concrete so much as with vast expanses of turfgrass. In fact, according to the U. S. Department of Agriculture, lawns have surpassed croplands as the most extensive managed landscape in this country. Though this approach to suburban landscape may be somewhat more visually appealing than concrete, it doesn’t provide much more welcome space for birds and other wildlife than a parking lot. Many species of wildlife are experiencing decreasing populations because their “homes” are disappearing (both the places and the plants). What I haven’t always seen so clearly is that the home of wildlife is also my home. More often I have conceived of the proper habitat for wildlife to be ‘out there.’ Even when, in times past, I looked out over the broad expanse of lawn in front of my home and didn’t see much in the way of wildlife, I wasn’t concerned because I had assigned the need for conservation of birds and other wildlife to the professionals. That’s why we fund nature preserves and parks, I thought. But I was living in a world not grounded in reality. The world is rapidly becoming more urban. It is becoming clear that if we are going to provide suitable habitat for birds and other wildlife, we need to incorporate it into our urban and suburban landscapes. How do we do that? Where will it happen? To begin with, it needs to happen in our yards. The fact is that individually owned private property (our yards) accounts for 25 to 35 percent of the landscape, and nearly half of the total green space in urban areas. Though our yards cover a relatively small amount of land compared to the total land area on earth, they can have a significant impact on the biodiversity of our cities and suburbs. The power to provide suitable habitat for birds is in our hands. A little research into recent scientific publications showed me that the fragmented landscape of my suburban neighborhood did not need to be lifeless. It is possible to have rich and abundant bird life in my community. Even in my yard. Even without a feeder. supplementing food resources, providing new nest sites, and increasing diversity. There have been many studies of the impact of urbanization on bird populations. While it may seem reasonable to predict that the variety and number of birds will continually decrease as one moves from the relatively undisturbed forest through the exurbs and suburbs to the urban core, the evidence does not support this assumption. Suburbs can provide suitable habitat for birds because there are more ‘edges’ and more intermediate disturbance that works to increase the diversity of bird populations. There is also a greater diversity of food, some of which is the result of homeowners who provide bird feeders but much of which is created by the choices of home gardeners who plant gardens full of a variety of native plants to attract birds to their yards. Native plants support significantly greater bird abundance, diversity, and species richness as compared to exotic plants or turf grass. They also have a positive influence on reproduction. Making the landscape more similar to native habitat by adding layers and increasing the diversity of plants while discouraging empty lawn are things we all can do to encourage a greater variety of wildlife in our communities—including birds. As I slowly came to realize the contribution I could make toward providing a welcoming habitat for birds in my neighborhood, I began to replace most of the lawn surrounding my home with gardens. These are not just pretty, still life gardens; but gardens that support all kinds of life. I planted seed-bearing plants for the birds—echinacea and Rudbeckia maxima (giant coneflower) and other prairie plants such as prairie dock, cup plant, and ashy sunflowers. I planted viburnums and winterberry hollies as well as serviceberry trees to provide edible fruit for the birds. I also planted native plants that attract pollinators, which will also provide insects the birds will need to raise their young. We can all have a yard that is for the birds; that will create a better habitat for them. If you are uncertain about how to start improving your own yard or which specific native plants will be most appropriate in your community, start with the Audubon Native Plants Database (https://www.audubon.org/native-plants). It will provide a list of plants native to your zip code so you can begin planting for the birds no matter where you live. As concerned birdwatchers and homeowners, we have a tremendous opportunity (and responsibility) to provide welcoming habitats for birds and other wildlife. If we do so, and others follow our example, breaking with tradition and converting even just a little bit of lawn into native gardens, it will have a significant impact on our suburban environment. As this view of our yards spreads, we will no longer need to worry about the need to pay to see a ‘tree museum’ but will be able to do much of our birdwatching right outside the door of our homes. Each year since 2007 we have watched patiently for the return of the monarch butterfly to our little half acre. That was the year Nan was walking along the fence on the south side of our yard and spotted a monarch caterpillar acting strangely. As she stopped to observe this behavior the caterpillar became a chrysalis right before her eyes. This set off a chain reaction of excited study and observation that led to the planting of various species of milkweed in our garden and the yearly collecting of monarch caterpillars to protect them from their predators and ultimately release them back into our garden. It’s our own little effort to counter some of the impacts of the eradication of milkweed from midwest agricultural land through the use of Roundup and the drive for efficiency that virtually eliminates fencerows and other ‘non-productive’ land where milkweed used to grow. The monarch migration from Mexico that begins each spring and leap-frogs north by generation doesn’t generally bring many monarchs to our garden early in the season. Though we have seen our first monarch the past two years around Father’s Day, they don’t stay long as they move on across Lake Erie and up into Canada. In fact, we generally don’t see more than a few monarchs until August when they come, lay their eggs on our milkweed, and prepare to begin the great migration south. So, along with the milkweed, we plant asters and goldenrod that will be in bloom late in the summer and on into the early autumn to provide a nectar source for our little friends. And we wait for them to come. Sometimes we will have quite a few, as in 2011 when we released almost 140 butterflies. Sometimes, as in 2013, we will see only a handful. But this year has been the best so far. This week we lost a good man. It seems that heaven’s gain always comes as our loss. Tim Bellamy (55) was a very bright man with a wry sense of humor. The world knew him was a software architect and a musician. Friends knew him as a loving father and a humble follower of Jesus. Tim had the ability to see through all kinds of pretension and make a quick comment that would cut to the heart of the matter in a way that would make those who listened realize that he wasn’t just a country boy from Mt. Sterling KY. And he was curious about all kinds of things … but mostly about things that mattered. He always had a book he thought you should read and appreciated it when you had one you thought he should read. I remember the Sunday we discovered we were both reading Anne Lamott’s Traveling Mercies. He could really get excited about a good read! He was also one of those rare people who spent more time listening to you than talking about himself. In fact, he seldom talked about himself. Tim and I served together in the same worship team for almost 15 years. He was an excellent keyboard player and knew intuitively how to use his gifts to help the congregation to worship without getting in the way. And no one who was part of that congregation in those years will forget the Sunday’s when Tim came early and told me that he would like to give the communion meditation. When the time came, he would stand nonchalantly in his jeans and plaid shirt and begin telling a story that would have the congregation thinking to themselves “where in the world is this going?” But as barely believable as some of those stories were, they always led to Jesus. As did Tim. It’s how he lived. It’s what he did. In the last few years, our paths went in different directions into different congregations and I didn’t really have much contact with Tim. Then just a couple of months ago I posted a book review of something I had read and Tim came right back with a positive affirmation that he appreciated the recommendation and had enjoyed the book. Tim was always paying more attention to you than you were to him. I miss him already. 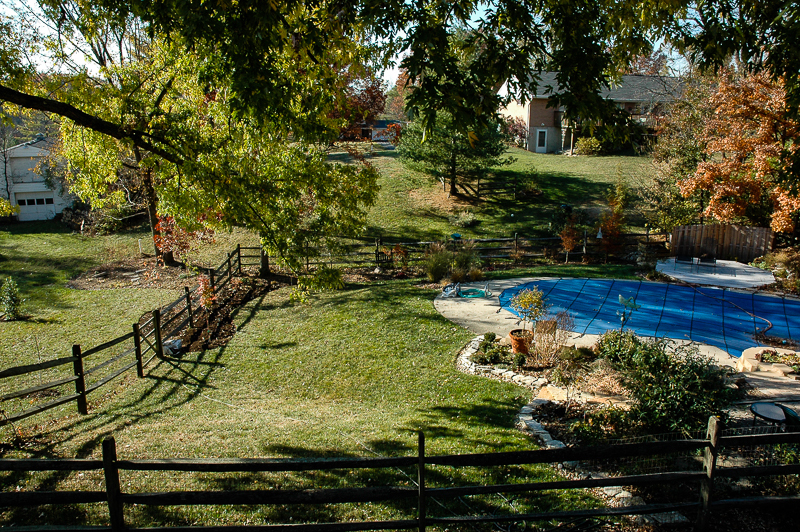 In the last few years as we have thought about what kind of environment we would like to create on our own half acre, we have focused primarily on solving some problems (the silver mapel over the pool, for example); adding gardens and rearranging existing gardens in our backyard and along our driveway. We moved fences out, moved trees to new locations and worked with a landscape designer friend to tie it together so that it doesn’t just look like “a jungle of plants.” All the while we have been learning not only about what “looks good” but also about “what is good” and what “good” we would like to do with the time and place given to us. 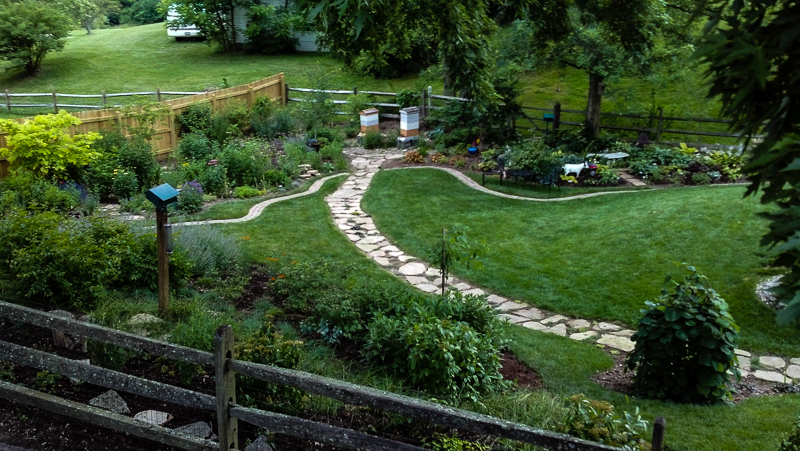 Having come this far (and we’re not sure how far this is yet), last summer we began giving serious thought to eliminating most of the monoculture we had for a front yard (grass) and slowly remaking it into mostly native, primarily perennial gardens. Back to the Garden Blog at WordPress.com.